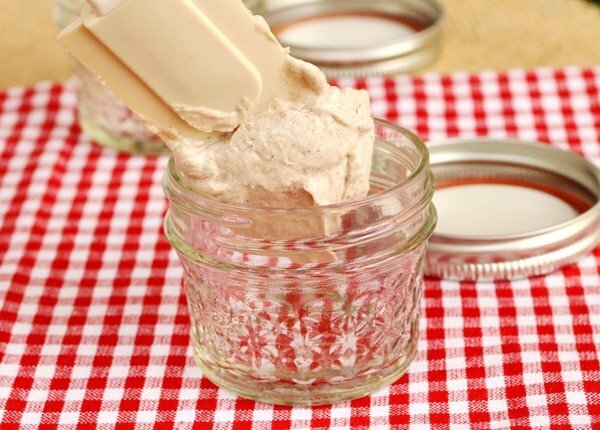 Everybody needs this homemade flavored butter in their life. One of my favorite restaurants is Lucille’s Smokehouse Bar-B-Que. I’m usually so hungry when I go out to dinner that I just love it when the restaurant serves something to snack on before dinner like tortilla chips and salsa, or fresh bread and butter. At Lucille’s they serve the most amazing homemade biscuits and apple butter while you’re waiting for your order. The apple butter is so tasty on the biscuits that I have to just slather it on. 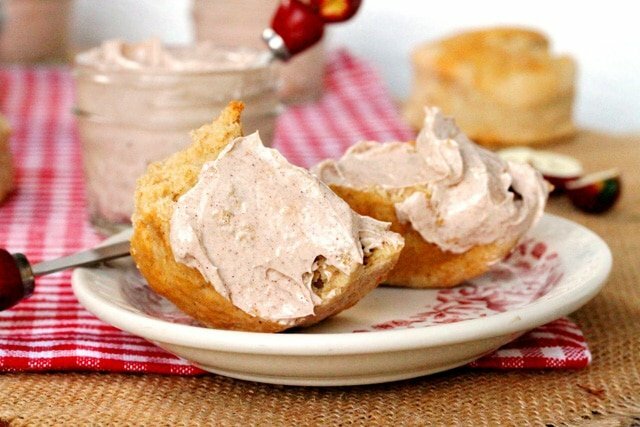 After enjoying these delicious biscuits recently, I had apple butter on the brain and just had to figure out how to make it. I’m not sure what Lucille’s uses in their apple butter but the recipe I came up with is really really good. The first thing that comes to my mind when I have it on my toast, is cinnamon toast. To me, it makes toast taste just like cinnamon toast. 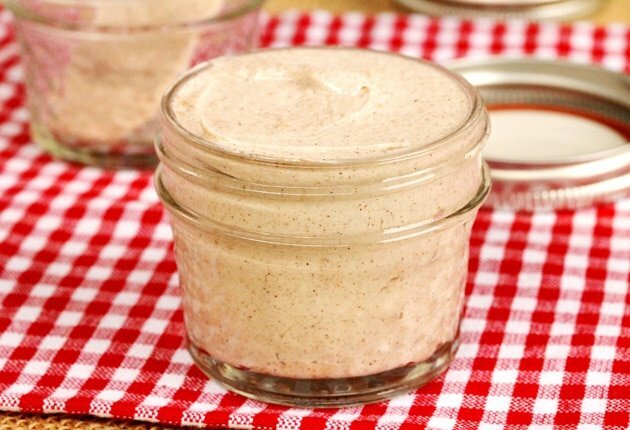 An option is to fill small 4 ounce jelly mason jars with this apple cinnamon toast butter, or small ramekin bowls would work nicely too. It lasts quite a while in the fridge, and these little jars of deliciousness are a great idea for small gifts during the holidays. I’ll be wrapping them in clear gift wrap and colorful ribbons to give out for gifts this holiday season. 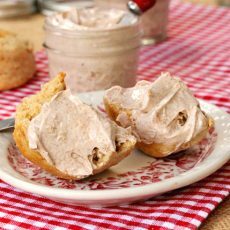 This apple cinnamon toast butter tastes great on biscuits, corn bread, muffins, toasted English muffins, or just a plain old slice of toasted bread. 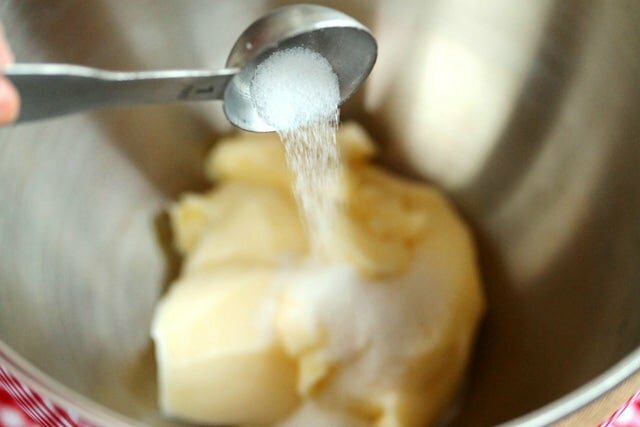 Add the softened butter to a mixing bowl. Whip the butter on high using the whip attachment. or cold right out of the refrigerator. Enjoy, and thank you very much for stopping by! 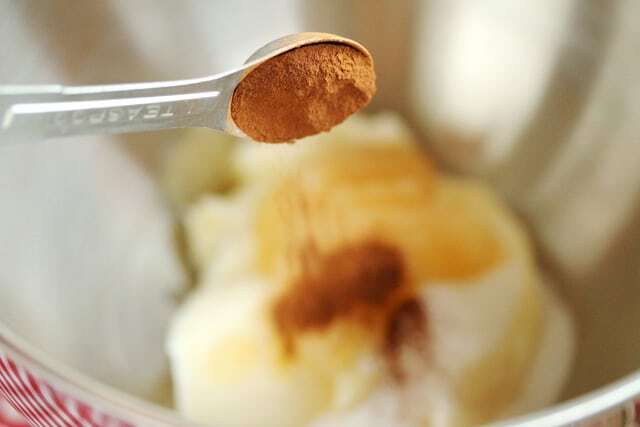 To a mixing bowl, add the softened butter, sugar, cinnamon, apple sauce, and nutmeg. 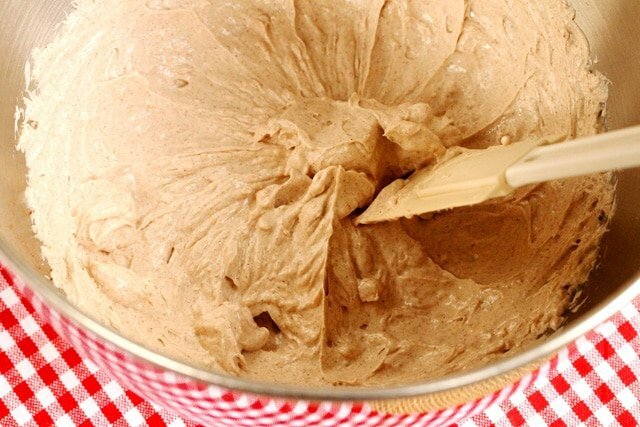 Using a hand or stand mixer, whip on the high setting (using a whip attachment) until creamy. 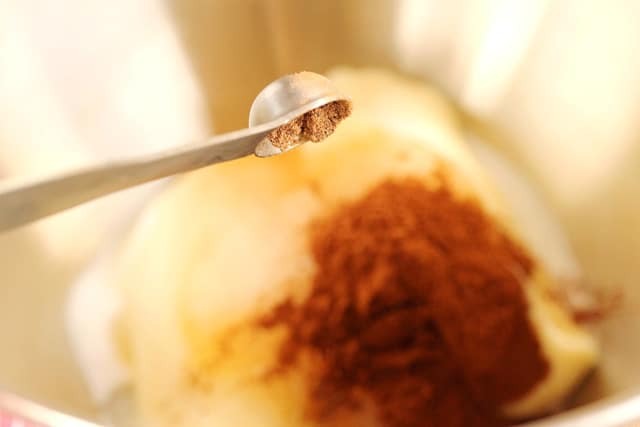 Serve soft right after making, or chill in refrigerator and serve cold. 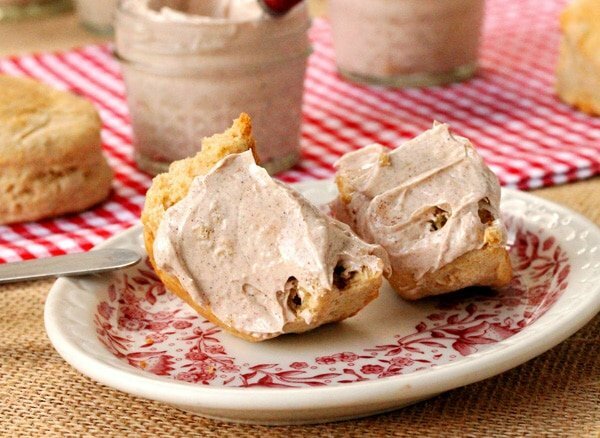 Serve on biscuits, muffins, corn bread, English muffins, or toast. This may sound like a silly question, but when do I add the sugar? Is it all at once or at the end? Hi Kary Ann, not a silly question at all! My mistake, in the directions I forgot to write in when to add the sugar. Fixing it right now. You add all of the sugar in the mixing bowl along with the butter, cinnamon, apple sauce and nutmeg. Thank you so much for asking this question! Just wondering if I can preserve this recipe? New to canning and preserving so I’m not sure how well the butter will stand up to being preserved. I want to make a large batch but don’t want it to all go bad before it gets eaten and I don’t have room in my fridge to keep it all. Any suggestions? Hi Kristina, freezing the butter may be an option. Hello! 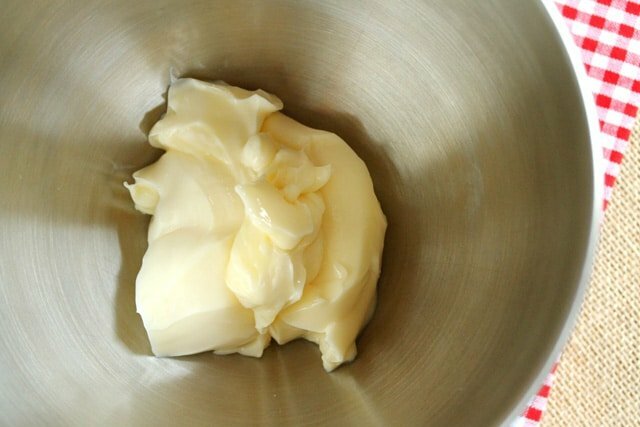 I am looking forward to making this “Lucille’s” butter. My question is, should I be using salted or unsalted butter? Thanks! Hi Addison, I like to use salted butter in this recipe. Thank you so much for stopping by! This may be a silly question, but how much does this make? It says serves 8, but calls for 5 mason jars. I am thinking of making these for Christmas gifts and want to make sure I have enough! Thanks! Hi Niki, great question. I think the serving size may vary depending on how much butter folks may use but 1 cube of butter equals 8 tablespoons so the 2 cubes that’s in this recipe would be 16 tablespoons. I estimated that if putting this flavored butter on a large biscuit, there may be 2 tablespoons of butter per biscuit. This is much more than what a serving of butter is but I rounded up just to be on the safe side. 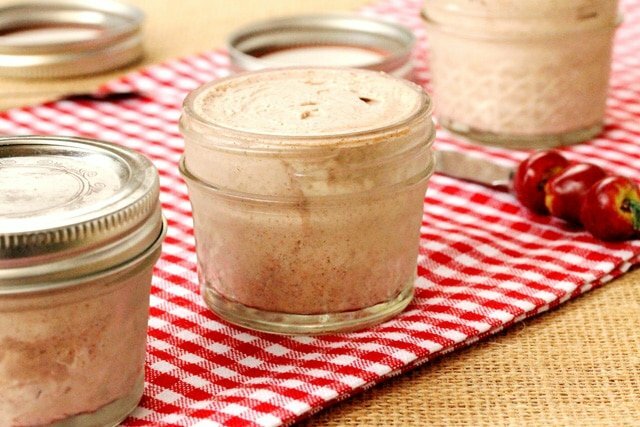 So in each of the 5 jars, there may be about 3 heaping tablespoons (depending on how full each jar is) which would probably end up being about 4 servings on average per small jar. 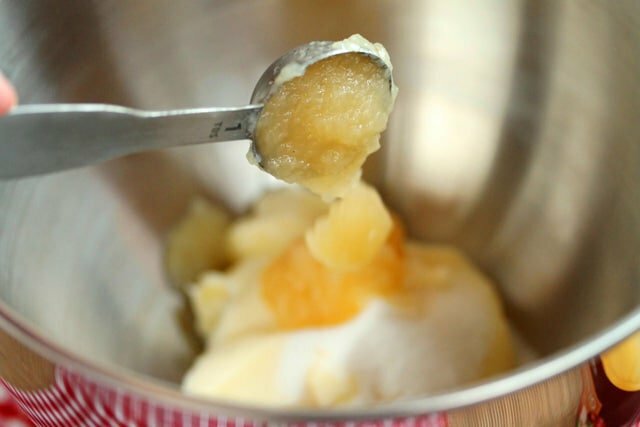 Depending on what size jar you use, an option may be to try putting just regular butter into the jar to ballpark how many tablespoons will fit in the jar, then estimate 1 tablespoon or less for each serving. I hope this helps. I made this massive BBQ spread for a summer dinner party and the most commented food was — the Honey Apple Butter. Almost everyone thought I was a genius for “hacking” Lucille’s butter. There was a lot of, “Ribs were great… But that Butter was delicious! And yes, this would’ve been a great giveaway at my party too, if I had known this was going to be a favorite. Thank you- this recipe DEFINITELY a keeper. Hi Leeshee, that is so great to hear! It’s amazing sometimes how the easier recipes go over so well. I’m so glad your guests liked it. Thank you very much for letting me know! 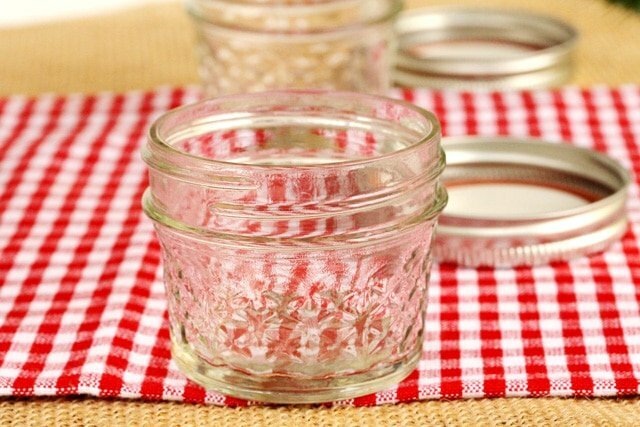 Do I need to go through proper canning process in order for this to stay fresh longer? I’m planning on making these as wedding favors ahead of time. Hi Sarah, what a great idea to make these as wedding favors! I’m not familiar with canning at all. But I did look up various flavored butter recipes and most of them mentioned to store the butter in the refrigerator. Many said the flavored butter may last for up to a couple weeks. 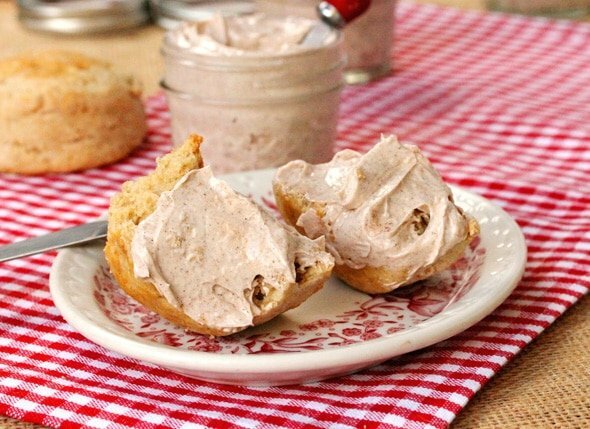 One of the recipes suggested using it within 5 days for the best flavor. So maybe storing them in the fridge may be a possible option. Such a cute idea! Oh please do send me a jar as well. 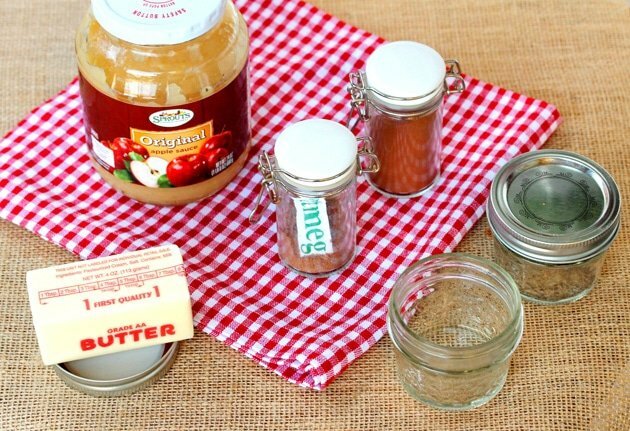 I love the idea of apple butter and your recipe sounds fantastic. Hi Marla, thank you very much in advance for the link back on your post! Have a great week!